Ocala, September 25, 2013: HDG Hotels' philosophy of brilliance in the basics continues to pay dividends in the third quarter of 2013. 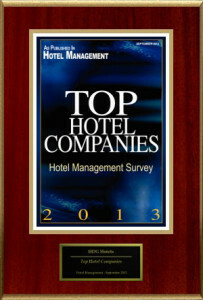 Notably, the September 2013 issue of Hotel Management Magazine, which is the leading hospitality news authority since 1875, ranked HDG Hotels as among the 190 Top Hotel Management Companies in the entire Americas. In addition to this distinction, the Holiday Inn Express Hotel and Suites OcalaSilver Springs won its second consecutive "Torchbearer Award." The InterContinental Hotels Group bestows its prestigious "Torchbearer Award" to the top 2% percent of its Holiday Inn Express hotels in North America. HDG's other Holiday Inn property, the Holiday Inn Express Hotel and Suites Inverness-Lecanto also won Inter-Continental Hotels Group's prestigious "Quality Excellence Award." The Award is given to the top 5% of Holiday Inn Express' in North America. Both IHG awards are the result of achieving the highest levels of excellence in all aspects of hotel operation – from quality to customer satisfaction. Finally, HDG's flagship property, the Howard Johnson Inn Ocala was awarded the prestigious "Howard Dearing Johnson Award" by its franchisor – Wyndham Hotel Group. This award is given to only one Howard Johnson property within the whole franchisee community that most closely epitomizes the values of its brand's founder - Howard Dearing Johnson. Navroz Saju, President and CEO of HDG hotels, spoke of these achievements as being reflective of a team that "consistently executes on the basics and the HDG vision." Saju further emphasized the importance of consistent rapid response execution in an industry where the margins continue to be razor thin due to the continued high costs of regulatory compliance and lack of net ADR growth.